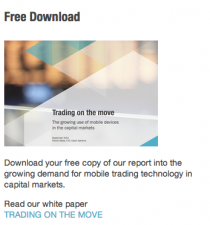 According to a report from McKinsey and Greenwich Associates, broker-dealers will need to leverage e-trading technology far more to assist their clients in liquidity discovery and help them with trade execution, as it has become increasingly difficult to find the ‘other side of the trade’. As can be seen from the graph below (taken from the report), there has been a huge reduction in the inventory held by primary dealers, which has directly impacted their ability to provide liquidity to clients. 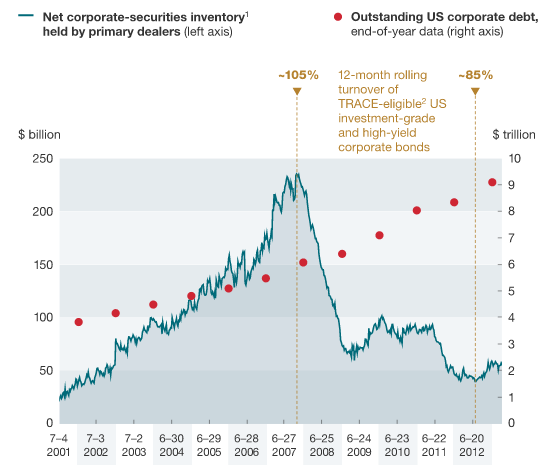 In less liquid markets like corporate bonds, banks have switched from providing clients with principal based execution from their own inventory, to an agency model, where they leverage their network of contacts to help clients find the other side of the trade, and charge them a commission fee. To help solve this liquidity discovery problem, a plethora of new platforms (such as Algomi – one of the more interesting entrants with their Honeycomb offering, Trumid, electronifie and Bondcube) have launched that seek to create and leverage a type of ‘social network’ for bond inventory, embracing ‘all-to-all’ model in the search for liquidity. Unfortunately, given the number of new platforms, and the limited ability for participants to on-board more than a few of the new platforms, many have struggled to gain traction in the market, and the latest casualty is newcomer Bondcube, which went live only three months ago, and has now filed for liquidation. “sufficient business prospects failed to materialise” and consequently “the shareholders decided not provide further funding”. It will be interesting to see which of the other new platform entrants are able to gain sufficient traction fast enough to survive! Good write up which summaries well the current state of flux in the FI market. This line though ” e-trading technology far more to assist their clients in liquidity discovery and help them with trade execution, as it has become increasingly difficult to find the ‘other side of the trade’.” Whilst right, surely the fact there are so many platform initiatives, further fracturing the market as customers can’t connect to all of the venues, will only make it harder to connect to customers in the short term ? Good point, and correct. So many new platforms, firms will possibly connect to a few, but then they will wait and see which ones stand a chance of surviving, which is of course the kiss of death to a fledgling platform hoping to gain traction.